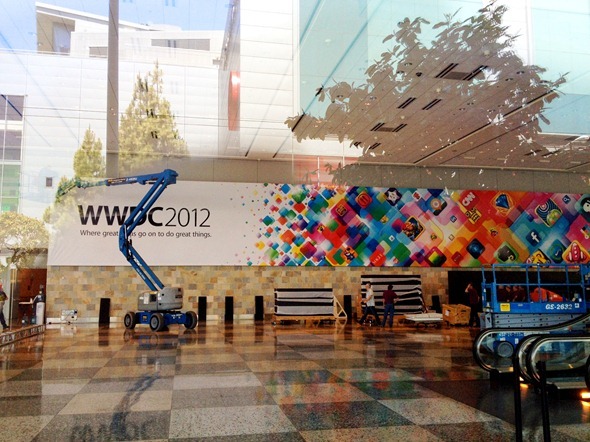 Apple has already started decorating Moscone with banners in preparation for WWDC 2012. With the event set to kick off in just a few short days, the buzz around it has almost gone out of control. Apple’s custom opening conference kicking off on Monday with a Keynote Address will finally unveil all the truth about the upcoming software and devices, as well as provide guidelines for the developers. Similarly to the past WWDCs, the whole attention of the technology-loving public is directed towards the event with the anticipation of a new device or new software to be unveiled. However Apple keeps the tradition of staying secretive till the very last moment, and all we know yet are based on rumors and speculations by “previously trusted anonymous sources”. Despite the fact that the new iPhone will not be unveiled till October, the idea of having a look at the sixth release of iOS is what amazes public quite a lot. However the one and only clue we’ve got from Apple so far is the banner put up recently that reads:” Where Great Ideas Go On To Do Great Things.” This statement may not tell a great deal, but this can’t stop rumors from flowing up… Check the image provided below yourself and do not hesitate to share your opinion on what the slogan of WWDC 2012 may be hinting at below in the comments.